Lima beans (Phaseolus lunatus), often called "butter beans," require planting after the last frost of the season to produce healthy growth and yield an abundant crop. A warm weather vegetable, lima beans will not tolerate frost or cold weather conditions. Prior to planting, the soil temperature should average between 65 F to 75 F for lima beans to germinate properly. Standard lima bean cultivars have a long maturity time span that often ranges from 3 to 4 months before harvest. Lima beans prefer a well-draining site with sandy loam. The plants produce a more prolific crop if the plant is located in full sunlight. The lima bean requires very little fertilizer during growth, but will benefit from the addition of a fertilizer to the soil prior to planting, in order for the seeds to start germinating vigorously. Working a 10-10-10 general purpose fertilizer and ammonium nitrate (33-0-0) into the soil a week prior to planting the lima bean seeds will help the plant thrive and attain healthy growth. Space rows 32 inches apart to offer the lima bean plant ample room for growth. Spacing each bean only 6 inches apart in the furrows will help the plants use each other for support. The plants tend to climb each other and weave together for support while growing. Lima beans prefer relatively dry soil conditions. They only require 1 inch of water per week during watering. The skin of the lima bean will often crack if the soil conditions are too moist during growth. If water sets on the plant's foliage for an extended time period, the lima bean will often develop fungal growth. The lima bean grows best with drip irrigation or a soaker hose so the plant's foliage and beans remain relatively dry. Weeds rob the lima bean of valuable water and nutrients. They can cause the plant to produce weak growth with a limited crop production. The lima bean plant produces a large root system that can easily be damaged by cultivation and weed removal. Reduce weed growth and the need for deep cultivation by applying mulch around the base of the lima bean plant. 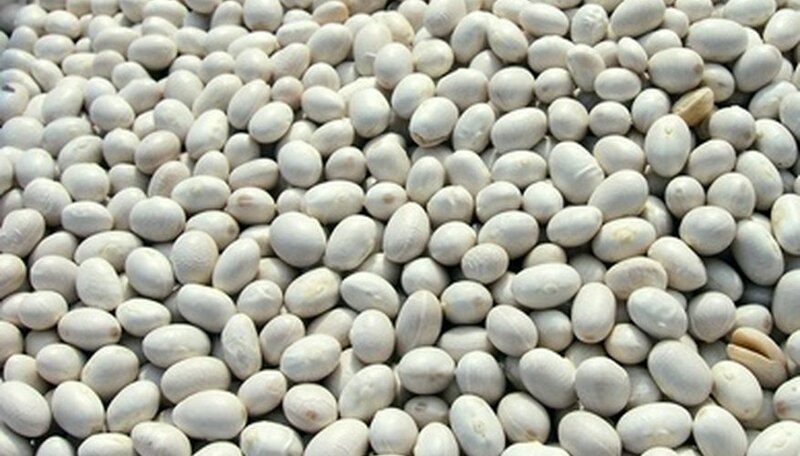 Most lima beans are ready for harvest from 60 to 80 days after planting. Pole bean varieties are slower to grow, possibly as long as 90 days. Pick pods as they appear ripe, plump and firm to the touch. Pods left too long on the plant will cause the beans to become tough and lose their flavor.